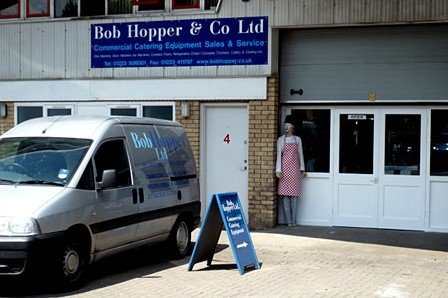 About Bob Hopper & Co Ltd.
We have over 30 years of experience in designing commercial kitchen areas. Whether you're after a brand new kitchen or looking to revamp and older one, we can help with design, layout, fabrication, installation and maintenance of new and old equipment. We will also advise you throughout the design process of our recommendations for equipment to suit your needs and circumstances. We work with and supply many major brands so you can be assured you'll be getting quality equipment. From teaspoons to fryers and from can openers to pass-through dishwashers and water boilers, we can supply you the right equipment for the job. We can supply most major brands of catering equipment such as Hobart, Maidaid, Lincat, Rational, Instanta, Gram, Sammic, Robot Coupe, Buffalo, Foster, Polar, Falcon, Blue Seal, Inomak, Blizzard and Denny's chefswear. Ordering equipment through us means that we can either have the product delivered direct to your site or we can take delivery at our shop and then have the product delivered to you at a time that is convenient for your and with an engineer to install if needed. Servicing is an important part of maintaining your catering equipment and helps to ensure that it will give good continued operation throughout the busiest periods of your business. We operate on a callout basis for on-site repairs and we have a workshop for repair of smaller, more portable items. We can service and repair most items including: Dishwashers, glasswashers, water boilers, fryers, combi ovens, mixers, blenders and veg prep machines, microwaves, ice machines and refrigeration units. We work with and can repair most major brands such as Hobart, Maidaid, Lincat, Rational, Instanta, Sammic, Robot Coupe, Burco, Buffalo, Foster, Polar and many more. You can call us on 01223 506001 or email for free quotations and advice or why not pop into our shop for a chat and to pick up a copy of our latest catalogue.